Erika Awakening Is A Location-Independent Entrepreneur Who Almost Gave Up Right Before the Miracle – Don’t Let That Happen to You! Hi, I’m Erika Awakening, and I am the founder of the revolutionary coaching method called Holistic Belief Reprogramming. Holistic Belief Reprogramming is very advanced EFT Tapping Emotional Freedom Technique. Today I want to share my personal story with you, so you can see just how dramatically my Advanced EFT Tapping coaching method has changed my life. Just THREE short years ago, I had an amazing passion for teaching and writing, and I even had started a popular blog that I wrote during my evenings and weekends. The problem? My Erika Awakening business was making basically zero money. And that meant that I had to keep my day job, working full time just to pay my bills, while my true passion was my blog and my teaching. Erika Awakening was incredibly frustrated … do you know the feeling? I knew in my heart that I could help a lot of people. And yet I had the classic spiritual healer mentality of “I just want to teach, I don’t want to sell.” The thought of learning how to market myself and “close sales” (a term I hate) triggered ALL OF MY DEEPEST FEARS. By the end of 2009, I did manage to make a little bit of money, but not nearly enough to quit my job. And this sad state of affairs continued until around mid-2010. I even hired an expensive copywriter and marketing “expert” to help me. Big promises were made to me, and I got caught up in it and gave my power away to this “expert.” The result? I paid a lot of money and made almost no sales. I hit rock bottom around June 2010, after spending thousands of dollars to fly to a speaking engagement in New York City. Although my speech went well and moved the audience deeply, I came home from the trip totally EMPTY-HANDED. I know many of you can relate to this – your content is fantastic, but you are not making the money! Not only did I not make one single sale, I had to refund money to someone who purchased from me before the trip because my workshop partner didn’t bring in any clients, and I didn’t think we were going to be able to give my client an experience worthy of the money he had paid me. Wow, was I bummed. I was literally CRYING on that flight home from New York City. I am not kidding when I say this, I almost quit the business entirely. I almost threw in the towel, and I almost GAVE UP. I felt lost, with no idea where to go from there. THEN SOMETHING AMAZING HAPPENED FOR ERIKA AWAKENING. I don’t know why I didn’t think of it earlier. I had been using my Holistic Belief Reprogramming (HBR) method – a very advanced version of tapping or EFT (Emotional Freedom Technique) to help men have more dating success with women, and I had used my method to improve my own social life and to increase income in other areas of my life. But I had not used my method in any committed way with my business. So I decided to start applying my HBR method to my business. What is Holistic Belief Reprogramming (HBR) by Erika Awakening? Holistic Belief Reprogramming (HBR) is a revolutionary system of self-empowerment, created by Erika Awakening. For those familiar with other energy medicine techniques, you can think of HBR as a very advanced version of Emotional Freedom Technique (EFT) or tapping. My Advanced EFT Tapping system operates on the premise that our beliefs dictate our reality. If we think it’s “hard work” to make more money, then it will be … because every belief is a self-fulfilling prophecy. If, however, we reprogram my subconscious mind for making money to be easy, then it will be easy. And this is exactly what Erika Awakening did in her own life using HBR. Erika Awakening went from “working hard” at a full-time job where she had very little freedom or upward potential to creating her own online business. Now Erika Awakening makes MORE money working from home than she did working as a lawyer. A lot more money. A multiple six-figure income. Working from home, setting her own hours, and mostly working in her pajamas. This is absolutely amazing for someone who had no sales or marketing training and no real prior business experience. It’s a good life, and Erika Awakening you to have this same level of abundance, freedom, prosperity, and happiness!! With Holistic Belief Reprogramming (HBR), if you practice this system in a committed way, miracles will become a way of life. You will come to expect miracles, and you will learn how to manifest miracles in every area of your life. Including money miracles. Lots of them! The Erika Awakening Holistic Belief Reprogramming miracle coaching method uses Emotional Freedom Techniques (also know as EFT or tapping) as one of its tools. However, in HBR, we use tapping in new and revolutionary ways to get MUCH MUCH FASTER and much more SPECTACULAR results than traditional tapping. In a nutshell: The fastest way to get your money miracle is to change your core beliefs and your belief system. And the fastest way to change your belief system is to learn and practice Holistic Belief Reprogramming in a committed way. Why I Don’t Care if You Think Erika Awakening is a Fruit-loop! Lo and behold, after I started applying Holistic Belief Reprogramming to my business with commitment, I created a miracle. I was amazed by this, and I finally told my day job that I would be quitting. Although I stayed there a few months more to wrap up projects and make this major life transition, in the spring of 2011, my dream finally came true, and I left my day job completely. After nearly GIVING UP on my business entirely in June 2010, I went on to make more than six figures for 2010!! (Yes, I really did, even though it was only evenings and weekends because I still had a full-time day job). And then the following year, I made more than $200,000 in my business. This year, as I write this letter to you, I have already surpassed my 2011 income. That’s right, over $200,000 in five months. About $90,000 in the month of May 2012 alone. Not only that, the business is getting simpler every day. A lot of the money now comes in while I sleep, and let me tell you it is an AMAZING feeling to wake up to cash in your inbox that you didn’t have to “work hard” to receive. Most days, I set my own hours and work in my pajamas. For me, this is a dream come true. I always wanted to make money working from home, but I thought it was “too good to be true” and that the offers on the internet were a “scam.” Of course, we want to be conscious of which offers we accept. Some “work at home” methods don’t work, and I would not recommend them to anyone. On the other hand, since so many people really do want to be working from home, we need real alternatives that make that possible. That’s what I am offering here. You are no different from me, and this could be you making good money doing what you love and working from home. Here I was, with no prior business experience, terrified of the sales process, always had a regular day job, and had no formal marketing or sales training whatsoever. How did I do it? I changed my core beliefs and my belief system. I used the same personal transformation coaching method, Holistic Belief Reprogramming (HBR), I’d been successfully using to help other people have a great social life and solve other problems to change my beliefs about business, sales, and money. And that made all the difference. When we change our subconscious mind, our entire reality changes with it. Instead of fearing that everyone would say “no” to me and feeling guilty about the money that I did make, I reprogrammed my subconscious mind to expect everyone to say yes to me (happily) and I reframed everything in my life as a win/win that any sane person would say “yes” to. So now I make a six-figure income online working from home in my pajamas, doing what I love, and helping others to do the same. For me, this is Heaven on Earth. And I LOVE that now I get to teach this amazing process to other people. NOW IT’S YOUR TURN TO SHINE AND HAVE THE FINANCIAL SUCCESS THAT YOU DESERVE. I created my Holistic Belief Reprogramming (HBR) products to help you have the same success I’m having, using the same powerful techniques for changing your belief system. In my 30-Day advanced EFT Tapping video programs, with 30 ultra-powerful tap-along videos guiding you through tapping sequences that will help you tune in to your business intuition, help you clear overwhelm and set priorities, and help you make sales and attract miracles into your business – all the while fulfilling your true life purpose, serving the highest good of yourself and everyone else SIMULTANEOUSLY. Sound too good to be true? It’s not. These are proven techniques that I have been sharing exclusively with my private clients FOR YEARS. With amazingly spectacular and indeed MIRACULOUS results for both me and my clients. For example, one of my recent customers went from making about $500 per month in affiliate sales late last year to around $5000 last month!! That is a ten-fold increase, and she did it just by tapping some of my Holistic Belief Reprogramming (HBR) videos. These are the five powerful and advanced EFT tapping products that will turn your business around. I suggest that you START SIMPLE with the basic Financial Abundance Challenge, and then grow your abundance skills from there. If you have any questions about how you can create a financially sustainable and thriving business using my products, please message me at Erika @ ErikaAwakening.com. But please DO NOT WAIT ANOTHER DAY to heal your root chakra and become sustainable. The planet is waiting for you to step into your power and go beyond the limiting beliefs that have been crippling healers and other helping professions for centuries. 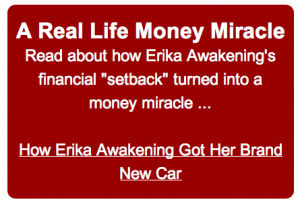 This entry was posted in Money Miracles + I Need A Miracle and tagged attract money, core beliefs, dharma, entrepreneurs, erika awakening, holistic belief reprogramming, life purpose, miracle coaching, money miracle, money miracles, personal transformation, subconscious mind by Erika Awakening. Bookmark the permalink.